Cerberus is one of the most easily identified of all creatures from Greek mythology, for Cerberus was the three headed dog also referred to as the Hound of Hades. As with most of the significant monsters of Greek mythology, Cerberus was considered to be the monstrous offspring of Typhon and Echidna, two serpentine monsters of Greek mythology. 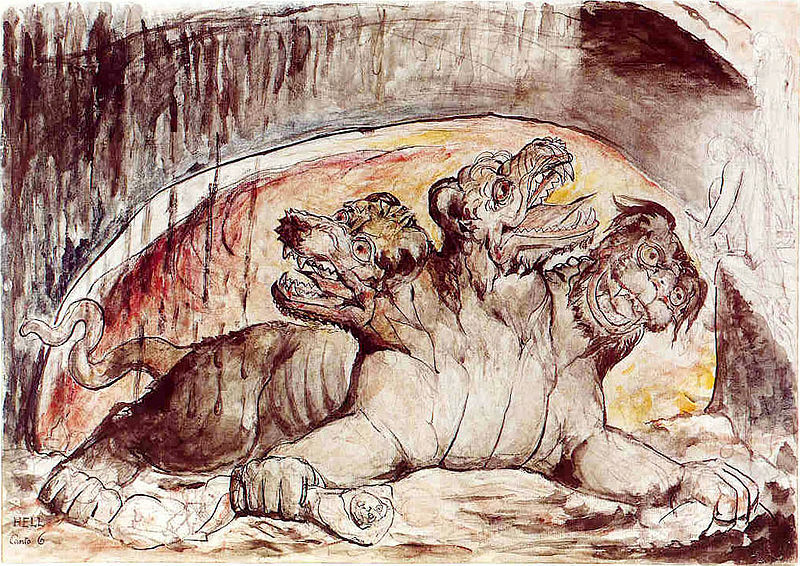 ​Cerberus was thus brother to the likes of the Lernaean Hydra, the Chimera, and another monstrous dog, Orthrus. The most obvious feature of Cerberus was the three dog heads upon a single body, but Cerberus also possessed a mane of snakes, a serpent’s tail, and the claws of a lion; a truly deadly beast. The Roman writer Ovid would state that the slobber from the heads of Cerberus was also a powerful ingredient in the poisons of the Erinyes as well as the sorceress Medea. The baying of Cerberus in the Underworld was also said to cause the arable land around the entrances to the realm of Hades to go untended, for farmers were scared away by the sound of the monstrous dog. Home for Cerberus was the Underworld, the domain of Hades, and the giant hound was given the job of guarding the domain. This meant that Cerberus would guard the Gates of Hell from unwanted intruders, and the monstrous dog would also patrol the banks of the River Acheron to prevent the shades of the deceased from escape. Now, Cerberus was a successful guard preventing the escape of the deceased, but there were many tales from Greek mythology of mortals successfully entering the realm of Hades, and the likes of Theseus, Pirithous, and Orpheus all made it past the Hound of Hades. The offspring of Typhon and Echidna are normally famous for their encounters with Greek heroes, with the heroes triumphing, and the monstrous children normally dying. Cerberus would ultimately be most famous for his encounter with the greatest of all Greek heroes, Heracles. Heracles at the time was in a period of servitude to King Eurystheus, and the king of Tiryns had set him a series of impossible labours to complete. A twelfth and ultimately final Labour was given to Heracles; and the hero was to bring back Cerberus from Hades. The fearless Heracles descended into the Underworld, and forced Charon to skiff him across the River Acheron. But rather than just taking Cerberus, and thus risking the anger of the powerful god Hades, Heracles went to the palace of the god, and there spoke to Hades and his wife Persephone. 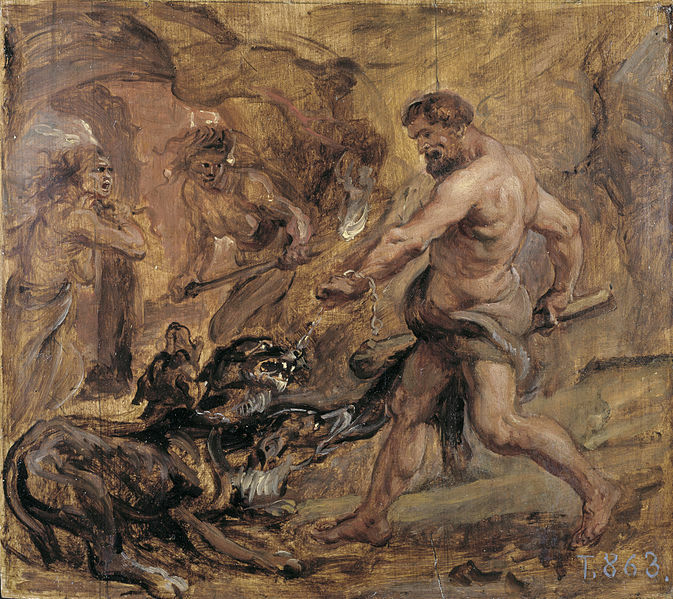 Heracles asked for permission to remove Cerberus from the Underworld, and Hades gave his permission, as long as his hound was not harmed in the process, and would be allowed to return once the task was complete. Heracles set about the task of subduing Cerberus, and with weapons laid to one side, Heracles wrestled with the Hound of Hades. Heracles got Cerberus into a choke hold, and eventually the monstrous hound submitted to the will of the demi-god. Having wrestled Cerberus into submission, Heracles would then drag the triple headed dog out of the Underworld, through the entrance at Tenarus. Cerberus was then led by Heracles through Greece to the court of King Eurystheus, and all men who saw the Hound of Hades were overcome with fear. With the final Labour completed. Heracles would return Cerberus to the Underworld, from whence after the monstrous dog would once again watch over the shades of the dead.